Bev Benda: My Coach Bev — When Money Doesn’t Grow on Trees, Must We Cut Them Down? Six years ago, my childhood home was bulldozed after the new owners had a fire and the city condemned it. When I learned that it took less than a half-hour to crush our huge old house into a pile of rubble and lay pavement in its place, I felt like my parents and seven sisters were also crushed into that pile. Our home was one of the original homesteads of Wahpeton, N.D. My mother painted it Bubblegum Pink for as many years as I lived in it. In her words, “Who couldn’t smile looking at this lovely pink?” My brother-in-law, Jim, nicknamed it The Wad. However, to sell it after my mother died, the Realtor suggested we paint it a drab gray. It was hard to look at it after that. I avoided it even more once I heard it was torn down. Yet when I finally mustered up the courage to see the property, I discovered grace had been granted. Driving up to my old address on a sunny July day, I discovered thick green grass and the majestic trees of my youth still standing. Yes, there was the big old tree that served as first base in hundreds of backyard softball games (until the night my twin sister knocked a homer through the glass porch window.) The white picket fence separating our property from the neighbors was shedding paint, but it was still ready to serve as “steady catcher.” The rose of China and flowering crab trees were in full bloom, fully pinkifying my world again. The banana tree out back was still shedding “baby bananas,” sustenance for our dolls and stuffed animals. In the years since, I was willing to go back and visit my childhood home of grass and trees, plop down under the big old tree and bask in a whirlwind of memories. Oh, if those trees could talk, they would tell of Kick the Can, Ante—I-Over and Starlite Moonlight games, snowball fights, crab apple battles, productive gardens, family reunions, animal funerals and burials and even a Wimbledon grass court in celebration of our favorite tennis event. They would tell of how my mother fed hobos picnic meals as they jumped off the trains near our backyard. The trees heard her explain to us why she did it: “God says to be kind to strangers, for you never know when you are entertaining angels.” From their mighty stature, they saw so much, including her last breath. Life, death, it all took place here. The city owned the land after the fire and eventually put it up for sale. Because it was next to the railroad tracks, it wasn’t very marketable, so I had this feeling I could visit it as my own for many years. Maybe it will become a little city park, just green grass and trees, where people (like me) can enjoy the greenery and the fragrant trees in the summertime? To sell it, the city rezoned my old address from residential to commercial and sold it recently to a computer business. Without any input from the neighbors, the computer gurus promptly cut down all the trees. Our beloved trees! I don’t begrudge any business for buying property that is inexpensive. 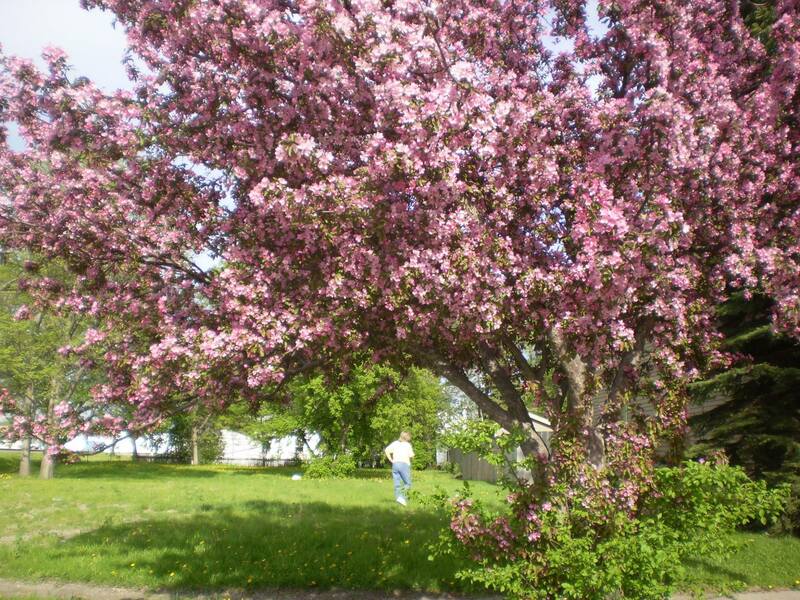 However, maintaining the beautiful trees of one of the original homesteads in Wahpeton, rather than impulsively cutting them down, is a decision that could have been made with more consideration. You may say it’s not my home anymore, so it’s none of my business. If this computer business wants trees, it can easily create trees on computer with a few clicks of a mouse. Never mind that computer-generated trees don’t provide shade or permeate an incredible fragrance blocks away — with eyes fixed to computer screens, these business owners are oblivious to the loss to the community. They aren’t concerned either about longtime neighbors who are mourning the loss of the trees. Money was the issue. And money did not grow on our trees. Fortunately, no tree-chomping truck will ever take those away from us. I enjoyed reading about your love of trees and your memories. We bought our house in EGF in an old neighborhood because of the big, old trees and the view of more in the distance from our windows. We both grew up with trees and needed them in our yard. We are moving soon and know it will be a selling feature for the new owners. I am sure the whole neighborhood is missing those trees. So glad you had a chance to visit them and remember your childhood before they were cut. I write poems for fun and once wrote a poem for a friend’s 40th birthday party. She was complaining about getting old so the first line was: I thought that I would never see, a friend as old as a tree. I do not recall the rest but we had a good laugh and nobody laughed more than she did. I think I will go hug a tree. Thank you, Helen, for your kind and comforting words. Bless you, and keep hugging those trees!